In the end, 162 games weren’t enough to settle two of the National League’s divisions. The Cubs, Brewers, Dodgers and Rockies all won in blowouts Sunday, setting up a pair of tiebreaker games Monday. The Cubs (95-67) will host the Brewers (95-67) at 1 p.m. ET, while the Dodgers (91-71) will host the Rockies (91-71) at 4 p.m. Both games will be televised on ESPN. It’s the first time in MLB history there have been two tiebreaker games on the same day. They are a relative rarity — there have only been four tiebreakers since 2000, and only one since 2013. All four teams would certainly like to have as easy a time Monday as they did in Game 162. Both the Dodgers and Rockies jumped out to big early leads. The Dodgers jumped on the Giants for seven runs in the third inning en route to a 15-0 win. The Dodgers pounded out 16 hits and Rich Hill gave up only two hits in seven scoreless innings. The Rockies scored two in the first and added a pair in the third and just kept on scoring in a 12-0 win over the Nationals. 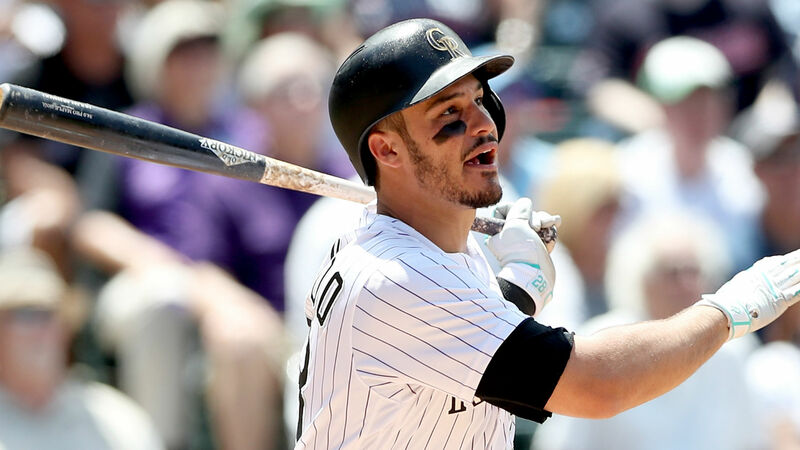 Nolan Arenado hit two of the Rockies five home runs, and Tyler Anderson pitched 7 2/3 scoreless innings. The Brewers likewise got out to an early lead, getting two in the first inning before rolling to an 11-0 win over the Tigers. The Cubs fell behind the Cardinals 2-0, before coming alive at the plate in a 10-5 victory. Anthony Rizzo and Javier Baez scored six of the Cubs’ runs. So that sets the stage for the two tiebreaker games Monday. In the NL West matchup, the Dodgers will start rookie Walker Buehler (7-5, 2.76 ERA), who has been hot down the stretch, with a 1.70 ERA in his last 11 starts. German Marquez (14-10, 3.76 ERA) will go for the Rockies. Jose Quintana (13-11, 4.09 ERA) is expected to start for Chicago, while Milwaukee’s starter hasn’t been announced. Noah Syndergaard pitched that ultimate rarity in today’s MLB, a nine-inning shutout, as the Mets topped the Marlins, 1-0. He yielded five hits and struck out six. Giants starter Andrew Suárez gave up six earned runs in 2 1/3 innings as the Dodgers jumped out to a huge lead early. J.D. Martinez hit his 43rd home run, the most by a first-year Red Sox player.